We at Jiffy Lube know what it is like dealing with the traffic in Southern California via a commute, especially in the Los Angeles area. It probably comes as no surprise that LA is known for being the worst congested city in the US and in fact, studies show that commuters in the LA area spend the equivalent of two workweeks per year behind the wheel. (Source: Reason Foundation). According to Texas Traffic Institute (TTI), LA’s travel time index is 1.92, which means that a trip during peak hours may take nearly twice as long as it would take during off-peak hours. So why is Los Angeles traffic so bad? The most basic explanation is that there are too many drivers trying to use the same roads therefore exceeding the maximum capacity. Out of the 1,721,778 workers aged 16 or older, 63.3% of LA commuters drive to work alone. Other factors that contribute to the traffic congestion include accidents, vehicle breakdowns, road construction and harsh weather conditions. Ramp metering -This can decrease the amount of accidents when entering the highways, and according to TTI has reduced the nationwide travel delay by over 29 million hours on a yearly basis. 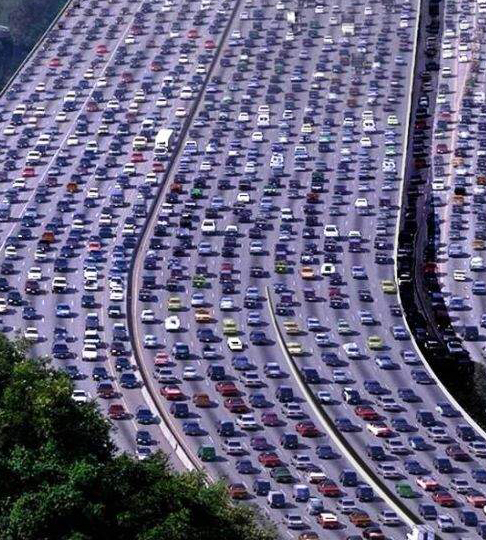 Use of high occupancy lanes (HOV), also called “fast lanes.” By requiring a certain number of people per vehicle in order to use dedicated lanes during peak hours, HOV promotes ridesharing and therefore reduces the number of cars on the roads. Adding lanes. Some opponents state that this only increases the number of cars on the road since people who have previously driven on side roads then decide to join highway drivers. In addition to ride sharing whenever possible, the main thing you can do is to take care of your car. By making sure that your car is properly maintained, you can prevent breakdowns on the road. This maintenance includes regular oil changes, engine services, tire rotations, and tire inflation. Additionally, while driving, keep a safe distance from the vehicle in front to prevent unnecessary breaking. If your situation allows for it, you can also either work from home or commute during off-peak hours. Visit us for your next oil change, and make sure to print out a discount oil change coupon before you leave home. During your visit, we can also go over your vehicle to ensure that it’s in top shape when it comes to preventive care.